We all have heard about the ancient settlement of Indus Valley Civilisation which is believed to be one of the oldest civilisations in the world dating back to thousands of years before the Christ Era. Dholavira is one such ancient settlement from the time of Indus Valley civilisation and is an archaeological site which was discovered in 1967. How about planning a trip from Ahmedabad to Dholavira this season and exploring the ancient ruins of Indus Valley civilisation? If you are one amongst those who are entirely into discovering things, then this article is definitely for you. As Dholavira experiences a hot and arid climate, it is advisable to avoid visiting Dholavira during the summer season. If you are looking to explore the beauty of this archaeological site under the comfortable sun rays, then the best time to visit Dholavira is from October until the end of March. By Air: You can take a flight to Bhuj airport and then from there, you can take a bus or hire a cab to Dholavira, which is located at an approximate distance of 210 km from Bhuj. By Rail: There are no direct trains available between Dholavira and Ahmedabad. The nearest railhead is at a distance of around 210 km from Dholavira at Bhuj. By Road: Dholavira is well connected to Ahmedabad and other major cities by road. You can either catch a bus or hire a cab directly from Ahmedabad to Dholavira. However, it is wise to take route 1 as it will take half an hour less to reach the destination. Moreover, the route is also filled with the scenic beauty of grasslands and trees. While on your way to Ahmedabad, you can take a break at Viramgam and enjoy the beauty of this lake town. Located in the Ahmedabad district of Gujarat, Viramgam is popular amongst tourists and bypass travellers for its quaint lakes, namely Mansar Lake and Gangasar Lake which are believed to be the origin of the town and are hundreds of years old. If you are on your way to Dholavira from Ahmedabad, then Viramgam should be your en route destination on account of its soothing environment spread all around the lakes. You can spot several people enjoying the beauty of the dazzling lake at the time of dawn and dusk. Dholavira is an archaeological site which contains the ruins of Indus Valley Civilisation. It is believed to be one of the oldest settlements in the world and the most prominent among the major archaeological sites of Indus Valley civilisation. Spread over an area of 120 acres, Dholavira is considered to be larger than the port city of Lothal and the most advanced in terms of city planning and management. 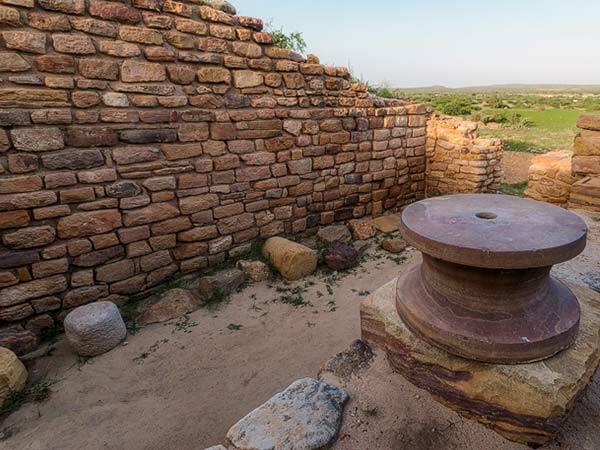 Today, you can only find the ruins at this historical site and several places which showcase the sophisticated and developed world of Dholavira. Once you have stepped on to the land of Dholavira, you will definitely get surprised by the beauty of this ancient settlement. From reservoirs to wells and seals to sandstone objects, each and everything at Dholavira is invaluable. Certain hemispherical constructions are also found at Dholavira which are believed to resemble the features of early Buddhist stupas. Even though there is not much to watch at this archaeological site apart from the ruins and certain artefacts of Indus Valley Civilisation, it still attracts thousands of historians and explorers through its age-old complex and millennium-old buildings. The setting of Dholavira clearly signifies its advanced settlement with proper drainage system and architecturally built rooms and other buildings. Reservoirs and wells found showcase the developing state of people which were the part of settlement at Dholavira and their rich culture. Certain other things which were found in the excavation include beads, inscriptions, seals, paintings, pots, rings and signboard, which are believed to be the most significant discoveries at Dholavira.